“Escena Tarifa” changes exceptionally on stage this November. On Thursday, the 8th the microtheatre will not be in the Royal Prison. 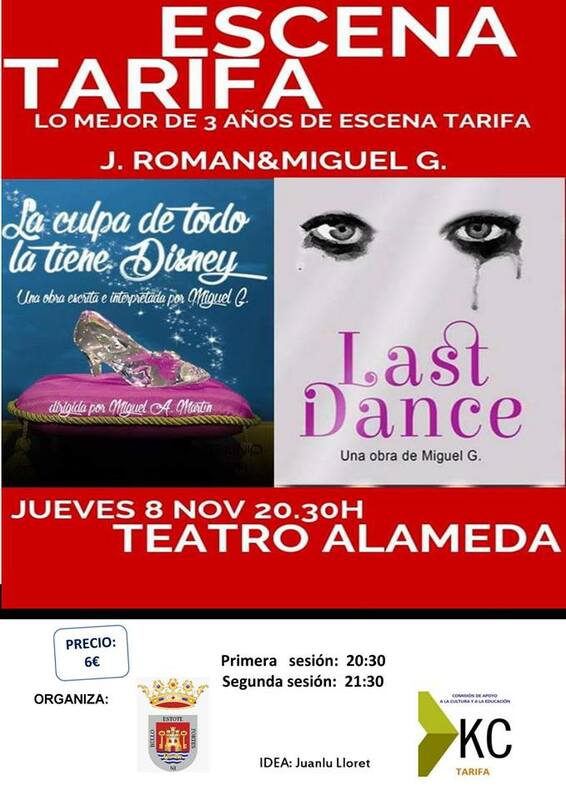 It passes to the municipal theater to offer two works of first; “Last dance” and “The fault of all is Disney”. The fourth season of the program promoted by KCTarifa continues to recover the best proposals in a retrospective of “Escena Tarifa”. The appointment, on Thursday, at half past eight in the Alameda. Written and directed by Miguel G., “Last Dance” is a work selected in the first edition of the Santiamén Fest. Jesús Román, absolute protagonist of the piece, puts himself in the skin of an actor who is so heavy with the character he has been representing for years, who has decided to take a drastic decision. “Last Dance” talks about normality, values, the struggle we sometimes suffer with ourselves and how important it is for human beings to be accepted. “The guilt of everything has Disney” is written and starring Miguel G. with the address of Miguel Ángel Martín. Cueta, in a comedy tone, everything a cleaner has done to be happy. Or rather, what she, who has grown up watching Disney movies, has interpreted what she had to do to be happy. Hooliganism and laughter in a work very much in line with other pieces by the author such as La Caja de Música. The appointment is on Thursday, November 8, at 8:30 p.m. at the Alameda Theater in Tarifa.